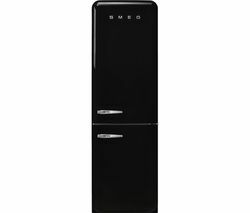 Smeg are known for making the most stylish fridge freezers. 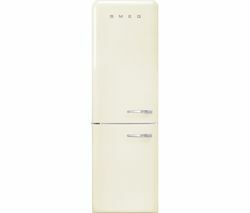 Smeg fridge freezers are distinct and colourful and will look good and add a touch of 1950’s inspired class to any kitchen. But they don’t just look good, they’re also engineered to the highest standards so your food will stay fresher for longer. Smeg fridge freezers combine two appliances into one so you save on much needed space when you install one in your kitchen and when you’ve spent time and money creating the perfect looking kitchen, it makes sense to choose a fridge that comes with plenty of retro wow factor. If you have leftovers from a large meal or you simply want to save a few slices of pizza for later, your food will keep for longer when you store it in a Smeg fridge freezer. The Smeg FAB32RNN comes in a glossy black finish and is as classy as it is practical. It will keep your groceries at the optimum temperature for hygiene and safety whether you store it in the fridge or the freezer compartment. When you return from your shopping trip and load up the freezer, the fast freeze function will lock in taste and nutrients quickly and efficiently. And as it boasts a A++ energy rating, it will keep costs down and have less of an impact on the environment. Whether you’re looking for a practical fridge freezer to impress guests or you simply want to add a touch of retro style to your kitchen, Smeg fridge freezers are the ideal choice. Check out more of our fantastic range from Smeg including classic fridges, cookers, dishwashers and many more.